Two Way Radio Blog – techwholesale.com » How Does a Two-Way Radio Repeater Work? How Does a Two-Way Radio Repeater Work? Learn how a two-way radio repeater works and discover if you need a repeater to expand the range of two-way radios in your fleet. In this article, we cover the basics so that you can be a better-informed radio consumer. A radio repeater is an electronic device that takes a low-level or weak audio signal and it raises it to a higher physical level while amplifying it to a greater power. It acts as a bridge between portable handheld radios so that signals sent back and forth will be heard clearly over a wider distance. The repeater takes the signal from a two-way radio and immediately re-transmits it at a different frequency and at a higher wattage than standard radios. It’s called a transceiver, since it can transmit and receive at the same time. A repeater communicates with all radio frequency receptors that operate on the same RF channel. Two different RF channels are used to carry the signals they receive and transmit. This makes them bi-directional with no danger of interference. This mode of operation is known as duplex. By comparison, when a push-to-talk switch is used on a walkie-talkie to transmit or receive, that is half-duplex operation. Certain newer radio repeaters offer both duplex and single channel (simplex) modes. For example, the Vertex SZ-PAX-7045 Repeater, available at Tech Wholesale, can be used as a repeater or as a base station, by pushing the push-to-talk button. Not all two-way radios can be used with a repeater. If you know you’ll need to communicate over a wide range and plan to use a repeater, make sure your radios are compatible. 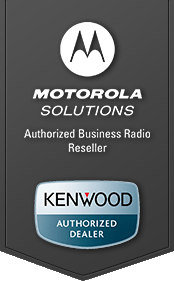 High-quality two-way radios that are repeater-ready include the Motorola CLP Series radios and the Motorola RDX radios. If you’re trying to communicate over a large area and especially if there are many obstructions, you may require a repeater. Water, air, structures and even a dense forest can absorb radio signals, causing a loss of signal clarity. The radio’s antenna height makes a big difference in signal range. If you’re operating in a valley and are surrounded by mountains (or tall buildings), you may notice reduced signal range. A repeater enhances radio signals both by re-transmitting from a higher location, with an external antenna, and by boosting the signal’s wattage.